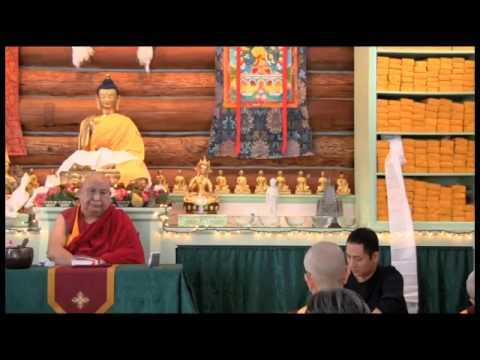 Teachings on Chapter 2 of Shantideva’s A Guide to the Bodhisattva’s Way of Life based on Gyaltsab Je’s commentary given by Khensur Wangdak Rinpoche at Sravasti Abbey November 24-26, 2010. Khensur Rinpoche was born in 1934 in Kham, eastern Tibet. He pursued the traditional studies of a monk and joined the great Drepung University near Lhasa until the 1959 exodus from Tibet. As a refugee in India, he continued to study intensively, preserving the ancient traditions of Tibetan Buddhism at re-established universities finally earning the highest academic honors. He was then invited to Namgyal Monastic University, the seat of His Holiness the Fourteenth Dalai Lama until 1995 when the Dalai Lama appointed Rinpoche as abbot and senior teacher at Namgyal monastery in Ithaca, New York. He now teaches at Chenresig Tibetan Buddhist Center in Connecticut. Khensur Rinpoche has made several visits to Sravasti Abbey.